Place to know about all IT System, Graphics Card AGP Card information, Computer hardware parts Technical Specifications guide and buying tips. Graphics Card or display card is used for high resolution display purpose in computer system. Although these day on-board display port is available on the motherboards of PC, but in some cases where the high graphics resolution is required then add-on graphics card is required. In past years, the Graphics Card was always required because the motherboard did not have its own graphics/ display port. It required connecting the separate display card on the ISA, PCI or AGP slots provided on the motherboard. But these days the motherboard is having its own graphics port i.e. the graphics chip is embedded on the board itself. One need to buy the graphics card only in case high resolution is required for gaming purpose or for certain other graphics applications. The main types of Graphics Cards are MGA/CGA, VGA, SVGA, PCI-VGA and AGP / PCI-e depending upon their technical architecture. Therese days AGP / PCI-e cards are being used; all other types of graphics cards have gone obsolete. MGA/ CGA (mono and color graphic adapter) were used in very old days before 1990s; there only purpose was to show the display on the monitor in terms of alphabets/ letters, there was nothing called a video stream kind of thing on those monitors. Then came VGA (versatile graphic adapter) which were able to provide display on VGA monitors with little high resolution and were succeeded by SVGA (Super VGA) and PCI-VGA cards. 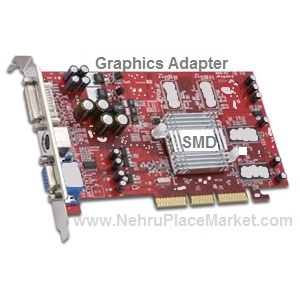 VGA-VGA cards were able to provide high resolution graphics for games and graphics designing software applications. The high video RAM was also supported in PCI-VGA cards say up to 4 MB. But still in some3-D games, video streaming and high resolution graphic applications more video memory was required to run them properly which was handled by AGP (Accelerated Graphics Port) and PCI-express Adapters which support the video memory in GBs. This Graphics Card Buyer's Guide will definitely help one for buying Graphics adapter. It is necessary for a buyer to know the main points to keep in mind while buying a Graphics Card or adapter. Why one need a graphics card – is the main point which affects its buying because one should not buy any graphics card just like that but one should buy it depending upon the need and requirement. For example if the purpose is ordinarily use of computer like word processing, accounting , movie or some games then a simple AGP/ PCI-express card with 1-GB RAM will be sufficient. Even this much capacity is already there in the onboard graphics adapter ports which are already available on the motherboards. One only needs to buy external graphics adapter if he needs to run high resolution 3-D video games or some advance drawing/ graphics designing software application. Check the technical guide/ user guide of that particular game or graphics designing software/ application for the minimum hardware requirement of graphics adapter specification. One must find minimum or recommended graphic adapter specification on all these type of software applications and then one can buy a graphics adapter according to these recommendation.